The Battle for the Cyberse is a major event in Yu-Gi-Oh! VRAINS involving the Knights of Hanoi and SOL Technologies. SOL Technologies wants to harness the Ignis and the Cyberse while the Knights of Hanoi wish to destroy them. Yusaku Fujiki and Kal Kolter became involved in the conflict after they captured an escaped Ignis, Ai. Varis attacking the Cyberse World. Five years before the start of the series, Varis assaulted Cyberse" with "Cracking Dragon" and restrained the Ignis that protected it. 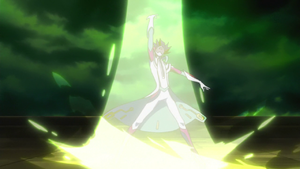 However, another Ignis appeared and forced a disconnection of Cyberse from the rest of the network, forcing Varis out of Cyberse while keeping its location hidden. Varis, furious by that Ignis' interference, ordered his "Cracking Dragon" to capture him, which led to the Ignis to be dismembered by the monster's jaws. This made Varis and the Knights of Hanoi spend the following years searching for that Ignis' parts in order to find the location of Cyberse. Spectre informs Varis about Playmaker's interference. In the present, the Knights of Hanoi continued their search of the missing Ignis but had many of their operations interrupted by the mysterious Duelist Playmaker, who defeated their agents, earning a name for himself. Spectre informed Varis that a trace of that Ignis was detected and that SOL Technologies was in pursuit. Knowing that if SOL retrieved the Ignis, they would be able to restore Cyberse and ruin the Knights' efforts, the Knights acted. Spectre informed Varis about Playmaker, who had interfered before. Varis wondered if Playmaker was a member of SOL, but dismissed the possibility as they would act more publicly. Spectre added that Playmaker erased every trace of his activity and eluded the Knights' searches, concluding that whoever he is he must be a skilled hacker. Varis became interested in Playmaker, but decided to leave him for now as the Ignis was their priority. While SOL Technologies performed a City Scan in order to search for the Ignis, the Knights of Hanoi decided to attack as the defenses of LINK VRAINS would be left vulnerable at that point. Varis ordered his men to search for the Ignis, assaulting the digital world with their "Cracking Dragons" and ravaging the users in their way, deleting their accounts in the process. The Ignis' remnants in the form of an eye was swiftly cornered by the Knights until Yusaku and Kolter used the lowered defenses to create an alternative path for him, who used the newly made escape route, but ended up in Yusaku's Duel Disk as a result. Yusaku entered LINK VRAINS using his persona Playmaker, saving the Celebrity Duelist Blue Angel in the nick of time before she was deleted. Yusaku then confronted the Knight of Hanoi who told him that the AI they were looking for was on his Duel Disk and threatened to delete it if they did not cease their attack. Since Ai was bonded to Yusaku's Duel Disk, the Knights must defeat Playmaker in a Duel in order to obtain it. Varis, watching from afar, was amused at Playmaker while the Knights' agent accepted the challenge. The Ignis estimated that Playmaker's current Deck was not enough to defeat the Knight's "Cracking Dragon". He caused a Data Storm and instructed Playmaker to ride the wind and enter a Speed Duel. Knowing the Speed Duel, the Knight Tribute Summoned "Cracking Dragon" by releasing two "Hack Worms" during his first turn. He was surprised when Playmaker Summoned a Cyberse Monster as was Varis, with the latter commenting that they had destroyed a vast amount of them to the point they believed Cyberse monsters to be extinct. Despite this, The Knight activated the effect of "Cracking Dragon", reducing "Cyberse Wizard's" ATK by 200 times its Level until the end of the turn and inflicting damage equal to that value to Playmaker. Playmaker activated the effect of "Cyberse Wizard" and changed "Cracking Dragon" to Defense Position which amused the Knight. Playmaker attacked "Cracking Dragon" with "Cyberse Wizard" but the Knight said "Cracking Dragon" cannot destroyed by monsters lower Level that itself. During his second turn, the Knight activated his Skill "Double Draw" letting him draw two cards. He activated his Spell Card "DDoS Attack", letting him target a Machine-Type monster he controls and send any number of "DDoS Attack" from his Deck to his Graveyard and inflict damage to the opponent equal to the number of send "DDoS Attack" times the Level of the target monster times 100. He sent two "DDoS Attack", targeted "Cracking Dragon" and inflicted 1600 damage to Playmaker who fell from his Duel Board but is saved by Blue Angel. Shortly after, The Knight equipped "Cracking Dragon" with his Equip Spell Card "Aircrack Storm" letting to "Cracking Dragon" to attack twice, if he destroys the opponent's monster by battle. "Cracking Dragon" attacked "Cyberse Wizard" but Playmaker protected it by using his Trap Card "Three Strikes Barrier". The Knight saw Playmaker be absorbed into a tornado within the Data Storm and said he'd be consumed by the Data Storm and meet his end. However, Playmaker managed to escape and performed a Link Summon to summon the Link Monster "Decode Talker". Playmaker activated the effects of "Decode Talker" and "Cyberse Wizard" to destroy "Cracking Dragon" and defeated the Knight. Playmaker subsequently attempted to interrogate the Knight, who started a self-destruction mechanism in response before Ai suddenly deleted him from the system to protect himself and Playmaker. Spectre and Varis subsequently elaborated the events of the Duel with Playmaker. Varis preferred Playmaker having his hands on the Ignis for a while over SOL Technology having him, but added they should not leave him with Playmaker for too long. He them summed up a list of characteristics of Playmaker's that might help discover his true identity, one of these being that Playmaker would eventually want to Duel him. Later on, Varis sensed the Ignis and tried to find him but failed. He later discussed a new program with Dr. Kogami. Hearing an alarm, Varis briefly logged off LINK VRAINS to go visit his father and assured him he would fulfill his wish. Later inside the Knights base, he and Spectre watched Blue Angel's public announcement to Duel Playmaker. Spectre told Varis that they could use her. Inside LINK VRAINS, Spectre appeared from the shadows to speak to a waiting Blue Angel. He told her how Playmaker hadn't showed up and she questioned if he was a Knight. Ignoring the question, he said hello to her and the section where they were meeting then turned into a darkened, digital area. Spectre, appearing bigger than his usual size, walked into Blue Angel before disappearing. The shock made Blue Angel shield her eyes. He appeared behind Blue Angel which shocked her and as she moved, he appeared before her. He said he was a fan of hers and she accused him of lying. He denied this and said he wanted her to beat Playmaker, while now appearing on the floor. Spectre then returned to standing and held up a glowing purple card. He fired it towards Blue Angel which hit her. He told her this card will open a door deep in your heart. He wished her luck and disappeared. The card seemed to be absorbed into her duel disk upon his exit. The Duel began and Blue Angel punished Playmaker repeatedly with the effect damage combo from her "Trickstar" cards forcing Playmaker to the defensive, although she later discovered it was his plan all along in order to use his Storm Access. Varis watched from afar, confident that once Blue Angel used "Dark Angel" she would be unable to disobey them. Blue Angel attempted to defeat Playmaker using her Skill "Trickstar Trick" in order to force Playmaker to draw cards and inflict game-ending damage, but he prevented this by using "Defect Compiler" to nullify the damage. With little resources left, Blue Angel resorted to using "Dark Angel", which had a severe effect on her. Playmaker rapidly used a combination of "Encode Talker", "Defect Compiler", and "Frontline Disturbance" to increase the ATK of "Encode Talker" and weaken that of "Trickstar Holly Angel" in order to defeat Blue Angel with a single attack. This page was last edited on 1 February 2019, at 03:48.